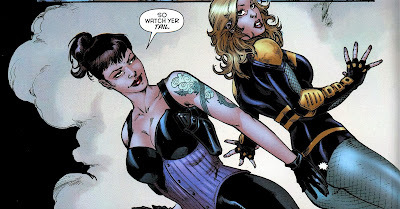 I just reread my review of Duane Swierczynski's previous volume of Birds of Prey, which indicates I enjoyed it quite a bit. I'm sad to say that the same cannot be said of this muddled, unfocused volume. The book begins by tying up the story begun in the previous volume. I think so, anyway, as it's been three years since I read it, and Swierczynski does little to reorient the reader. It's pretty unsatisfying. I thought Black Canary formed the Birds of Prey to take down some bigger threat, but here the bad guys are just after her-- for murder! (Of her husband, no less.) Which hardly makes them "bad," though their methods are pretty over the top. But one giant fire/explosion, and this plot line is completely over, which seems a little easy. Good guys without superpowers can jump out of exploding buildings and be unharmed. The book then becomes a series of weird detours, made worse by the fact that regular artist Jesus Saiz departs and is replaced by Travel Foreman, who is just... not great. His action is blocky and without energy, and his characters start out looking a little too posed and get worse and worse across the course of the volume. His first story is about a "Talon" of the "Court of Owls": all derived from an exciting Batman crossover, I'm sure, but it comes out of total left field within this book. It hooks into the ongoing narrative of Birds of Prey, though, as it ends with Poison Ivy being grievously injured taking out the Talon, and Black Canary fulfills a promise she made to her ("months ago," apparently, even though I think this team could only have possibly been together a couple weeks by internal chronology) to take her to the jungle. Batgirl comes along too-- I guess she's joined the Birds? What are you doing with those faces, Travel Foreman? 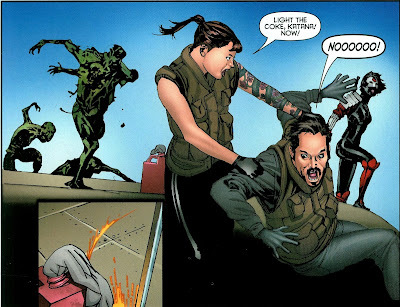 Like, twelve issues in and I still don't really get who Katana is or why she's there. But why did she form this team? This incarnation of the Birds doesn't have as clear a purpose as the previous, Oracle-driven ones. (Like, why is Katana even there?) Swierczynski tries to clarify this with one final issue that flashes back to the first meeting between Black Canary, Batgirl, and Ev Starling. 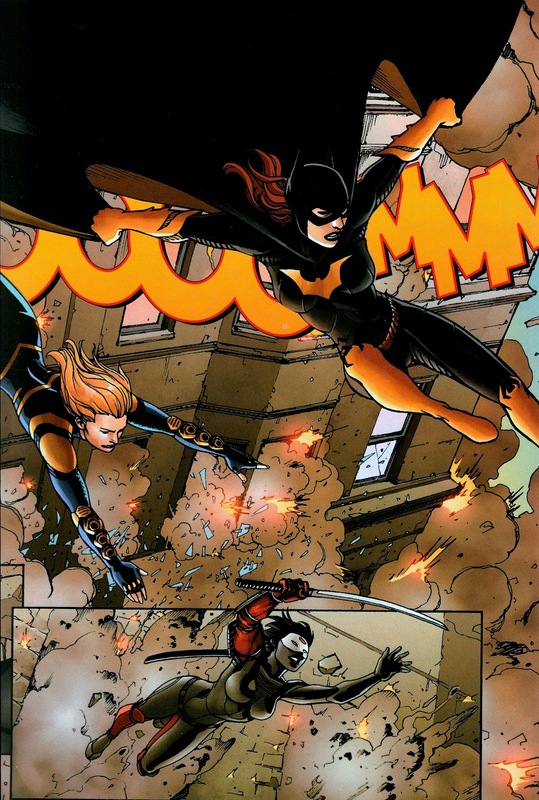 At this point, Black Canary is working undercover at the Penguin's lounge, fighting crime on her own; Starling is an enforcer for the Penguin because she has nothing better to do; and Batgirl is a recent crimefighting debut on the Gotham scene. The three end up working together to take down an arms deal, Black Canary ponders what it would be like to be "on the right team," Ev says she'll stick by Canary, and Canary poses in her underwear for the reader. It's okay, but doesn't really give you a sense of why these characters would want to work together. Hopefully the next volume presents a better reason for this team to exist than this one. This issue probably has some of the best art in the book, but it's frankly impossible to make Black Canary's original New 52 outfit look good. Seriously, who came up with that and what were they thinking? Next Week: A quick diversion into the backstory of Black Canary, as Team 7 learns to Fight Fire with Fire!